Helping students develop their ability to deliberate political questions is an essential component of democratic education, but introducing political issues into the classroom is pedagogically challenging and raises ethical dilemmas for teachers. Diana E. Hess and Paula McAvoy argue that teachers will make better professional judgments about these issues if they aim toward creating "political classrooms," which engage students in deliberations about questions that ask, "How should we live together?" Based on the findings from a large, mixed-method study about discussions of political issues within high school classrooms, The Political Classroom presents in-depth and engaging cases of teacher practice. Paying particular attention to how political polarization and social inequality affect classroom dynamics, Hess and McAvoy promote a coherent plan for providing students with a nonpartisan political education and for improving the quality of classroom deliberations. The authors raise many questions about ethical problems teachers confront, not only in terms of what issues they choose to discuss but also how they ensure that all sides of a controversy are presented fairly and decide whether to reveal their own political leanings. Learning to respect those who have different perspectives is an important component of students’ experience, as is using evidence appropriately. Readers of this book will gain a deeper understanding and appreciation of these complex issues. … Summing Up: Highly recommended. Upper-division undergraduates and above. How can schools prepare students to become knowledgeable and engaged citizens of our democracy? Hess and McAvoy provide a deeply researched and philosophically sophisticated answer to that challenge. In our increasingly polarized time, McAvoy and Hess show how the need for education in deliberation about controversial public issues has never been more urgent. This brilliant book could not be more timely. This astute, rigorously researched, original, and timely book describes how teachers can effectively teach civic knowledge and skills in today’s highly polarized times. The vivid and engaging portraits of teachers and schools and the seamless ways in which it blends theory, research, and practice make this book a unique and compelling contribution to the literature on the civic engagement of youth. It is an indispensible reference for educators who want to strengthen democracy and increase the civic literacy and participation of youth. 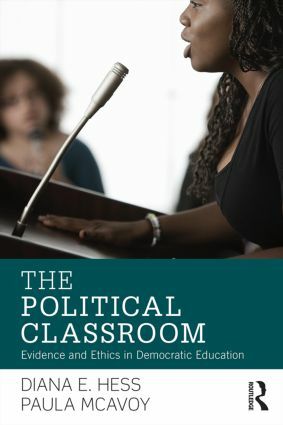 The Political Classroom uses powerful research to reveal the complexities of engaging students in "best practice" discussions of the controversial political issues they will confront throughout their lives. In doing so, Hess and McAvoy show how important teachers are to fulfilling the promise of democracy in our time. Hess and McAvoy’s research is forward-looking in two important senses: in its focus on the political education of youth, who will soon be voters and otherwise civically engaged adults; and because it offers badly needed, evidenced-based guidance about how we can cultivate citizens who thoughtfully reflect upon their values, and who respectfully engage with others across differences of opinion. Diana E. Hess is Dean of the School of Education at the University of Wisconsin-Madison, USA. Paula McAvoy is Program Director of the Center for Ethics and Education at the University of Wisconsin-Madison, USA.